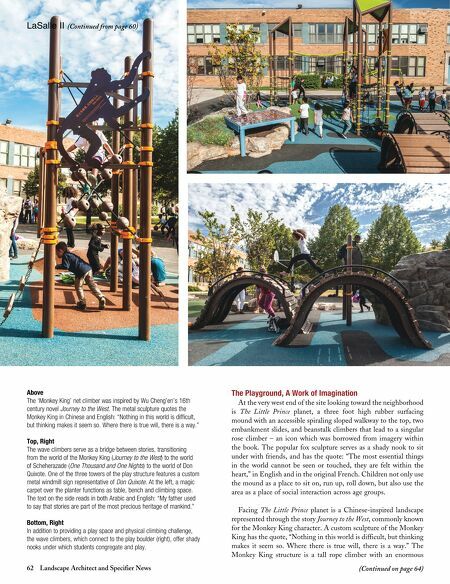 62 Landscape Architect and Specifier News (Continued on page 64) LaSalle II (Continued from page 60) The Playground, A Work of Imagination At the very west end of the site looking toward the neighborhood is The Little Prince planet, a three foot high rubber surfacing mound with an accessible spiraling sloped walkway to the top, two embankment slides, and beanstalk climbers that lead to a singular rose climber – an icon which was borrowed from imagery within the book. The popular fox sculpture serves as a shady nook to sit under with friends, and has the quote: "The most essential things in the world cannot be seen or touched, they are felt within the heart," in English and in the original French. Children not only use the mound as a place to sit on, run up, roll down, but also use the area as a place of social interaction across age groups. Facing The Little Prince planet is a Chinese-inspired landscape represented through the story Journey to the West, commonly known for the Monkey King character. A custom sculpture of the Monkey King has the quote, "Nothing in this world is difficult, but thinking makes it seem so. Where there is true will, there is a way." The Monkey King structure is a tall rope climber with an enormous Above The 'Monkey King' net climber was inspired by Wu Cheng'en's 16th century novel Journey to the West. The metal sculpture quotes the Monkey King in Chinese and English: "Nothing in this world is difficult, but thinking makes it seem so. Where there is true will, there is a way." Top, Right The wave climbers serve as a bridge between stories, transitioning from the world of the Monkey King (Journey to the West) to the world of Scheherazade (One Thousand and One Nights) to the world of Don Quixote. One of the three towers of the play structure features a custom metal windmill sign representative of Don Quixote. At the left, a magic carpet over the planter functions as table, bench and climbing space. The text on the side reads in both Arabic and English: "My father used to say that stories are part of the most precious heritage of mankind." Bottom, Right In addition to providing a play space and physical climbing challenge, the wave climbers, which connect to the play boulder (right), offer shady nooks under which students congregate and play.